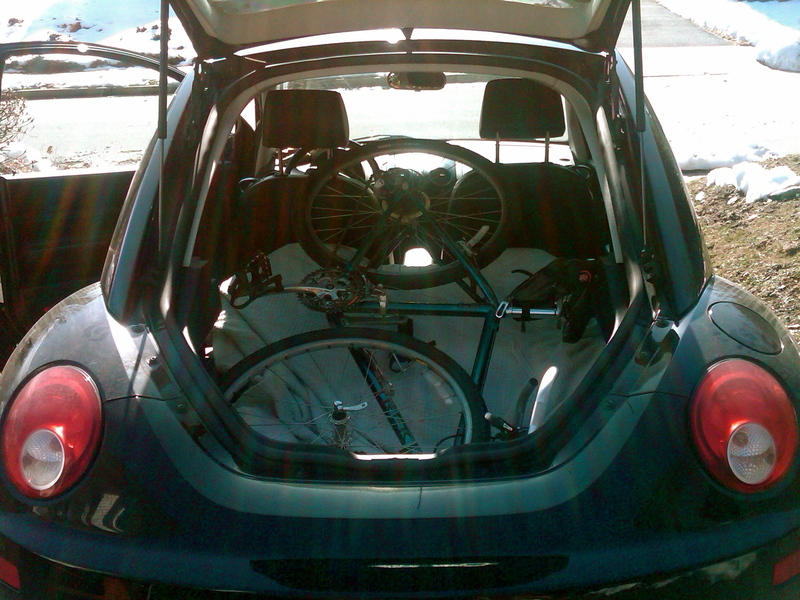 2011/365/044: Leisurely Sunday Ride? Hardly! This is how our Sunday ride all started. Getting the Bug to eat the bike. My friend Trina and I decided that 6 a.m. would be a good time to hit the NCR trail this morning. We knew that we had only 90 minutes to ride, but we were certain we’d be able to get a good 12 miles in before we had to be back on the road for our own familial commitments. When we arrived, both of us forgot about one small, little, tiny detail. Snow and Ice. This what we faced at the head of the trail at Monkton Station. It was 24 degrees with 10-20mph winds. Turn back now and lie to our friends about just how challenging it was? Tempting, but never a real option. We get out on the trail before sunrise to experience all that life has to throw at us, and we were hardly going to back away from this small, inconvenient challenge. 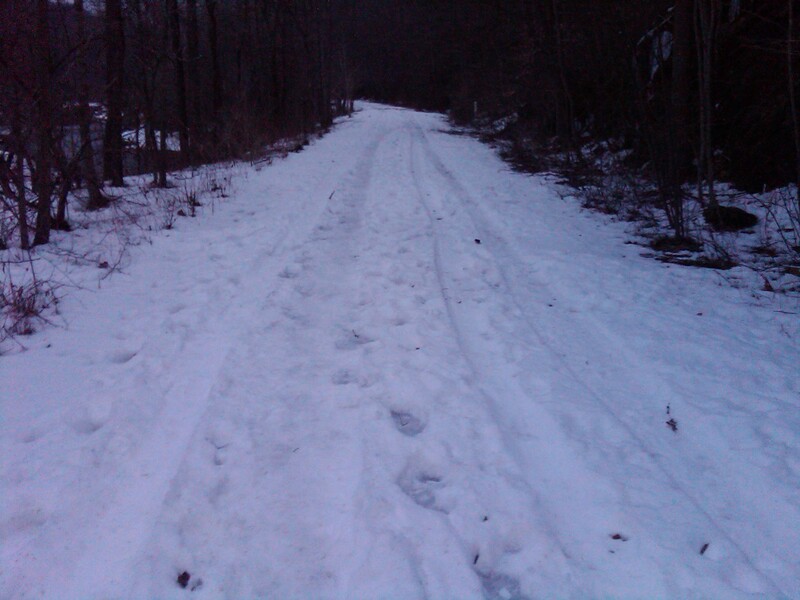 Of course, I did pick the wrong time to change my knobby trail tires for the thinner, smoother hybrid treads. The intention was genuine: smoother tires, smoother ride, yada yada yada, I bike for a longer distance and feel really good about myself (go me, as the faddy saying goes). So there we were, in darkness, with smooth tires, and a bunch of ice and snow in front of us. Trina didn’t hesitate. Off our bikes literally, that is. The first attempts to get going were ridiculous. 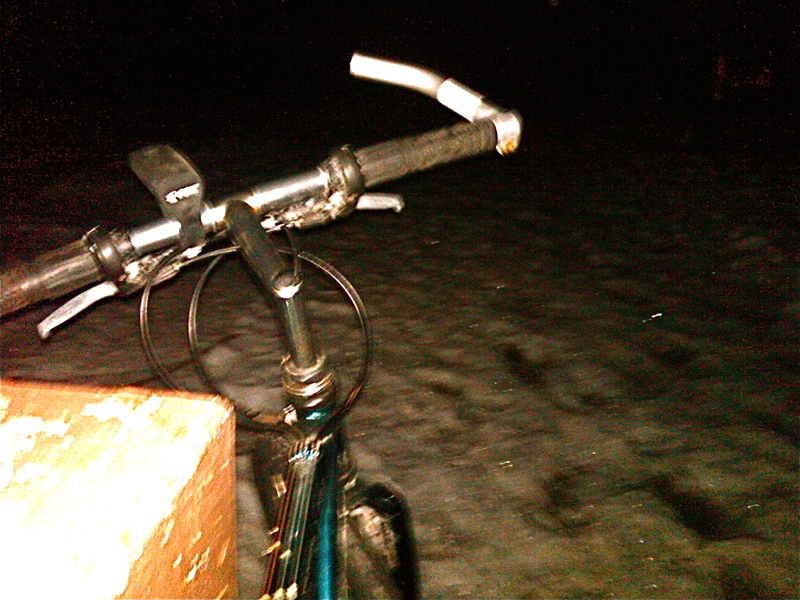 On the bike, in the snow. On the bike, on the ice. Fun times. One of the great things about Trina is that she does not know how to quit. I realized this back in the mid-80’s when she made me run up Cross Campus Drive while in training (for what, I cannot remember). So, thanks to her encouragement and persistence, we kept trying until there was forward motion. The goal, we soon learned, was to stay in the thin tire grooves of some kind of SUV that took a ride along the trail in the last week or so. It wasn’t perfect by any stretch of the imagination, as just a little bit of walking in that past week blurred the grooves of the track, and in some places, we were riding on pure ice. When we were able to stay in the grooves, we were able to stay upright. That was what was so tricky and required great control from both upper and lower body muscles. Our legs had to keep pedaling through the snow and ice to stay upright, but at the same time, we had to try to keep control of where we were headed, thus constantly struggling with the position of the front tire–especially when we would stray from that small and inconsistent tire groove. The first mile had me sucking wind like I’ve never done on any of my workouts at the gym. 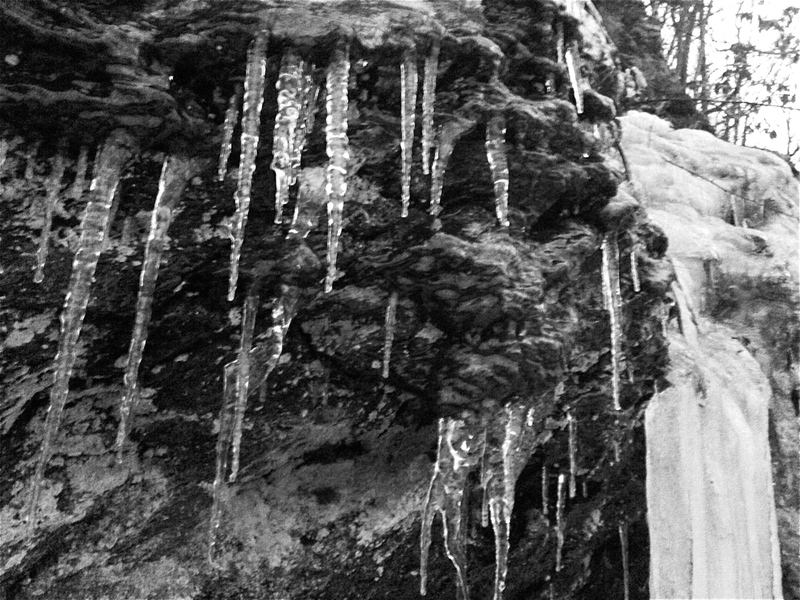 We decided to take a break, and when we did, we were treated to a Luray Caverns-esque treat from the stalactite-like icicles on the east-side rocks. We ventured on, and Trina made it to our 2-mile destination. I tried my best, but I could not find the strength for that last half-mile, knowing we had to trek another 1.5 miles to get back to our cars. 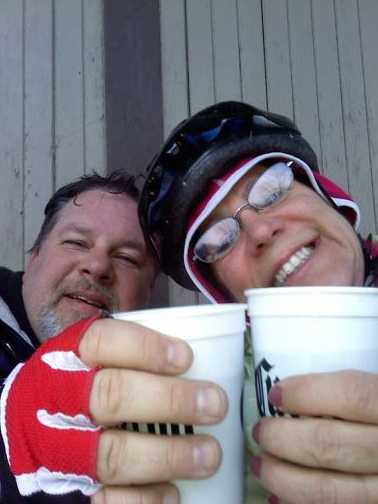 When Trina and I met up again, we headed back to the trail head together. The ride back was quiet, as we did our best to stay focused on the narrow path and stop as few times as possible. Trina pulled away as we got closer to the parking lot, and after I took another short rest, I got back on my bike and pedaled across the “finish” line. There stood Trina, applauding, cheering me on. We took a moment to share a hot cup of coffee before heading our separate ways to our still-sleeping families. It was probably the shortest ride we’ve ever taken together, but it was one of the hardest and most satisfying. Now, 12 hours after we got off the trail, my whole body aches, and I know that tomorrow it will feel even worse. But it’s that good kind of pain, where you know that you worked hard for the burn. I’m grateful Trina pushed me as she did, and I know that when we’re on the trail hitting 20 miles in the spring, I will be happy that we kept training, even through the snow and ice.